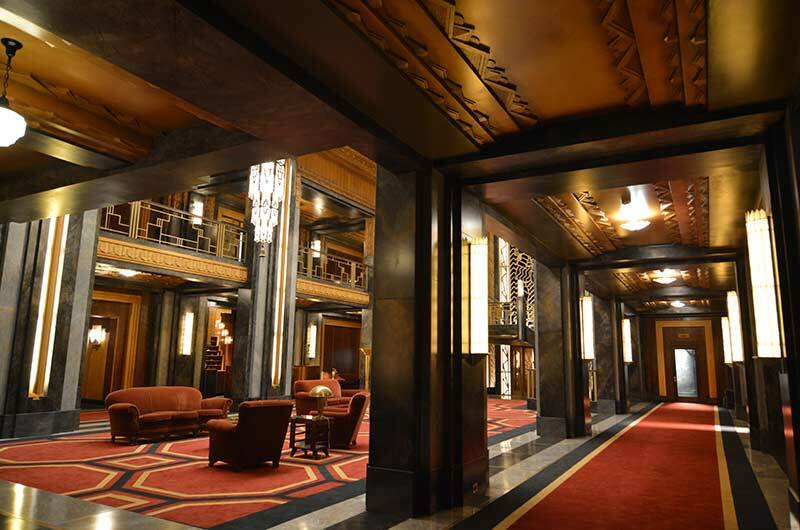 The 2-story lobby with mezzanine bar and a working elevator was actually built on stage! The rugs and carpets were custom made, as was the mohair-covered furniture. 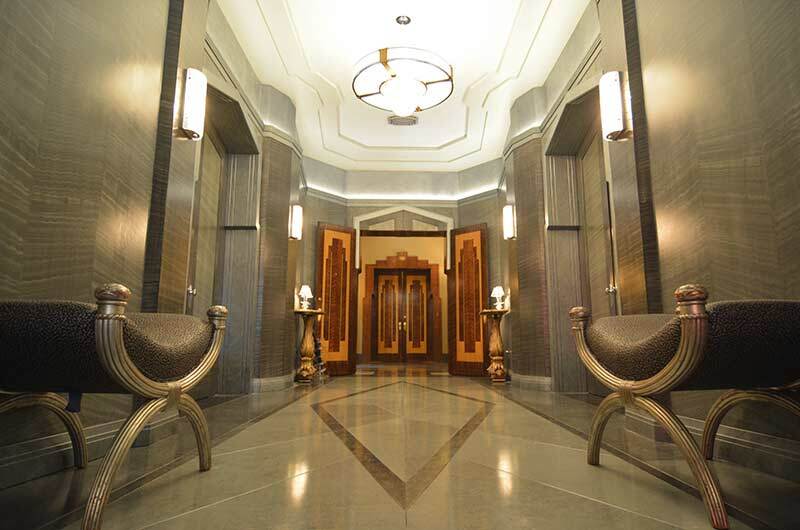 “We wanted it to have an aging gilded vibe,” Set Decorator Ellen Brill SDSA reveals. Photo by Prashant Gupta ©2015 FX Networks. All rights reserved. Chairs, bar stools and custom booths are upholstered in the same vintage velvet. Booths were made to fit into alcoves. 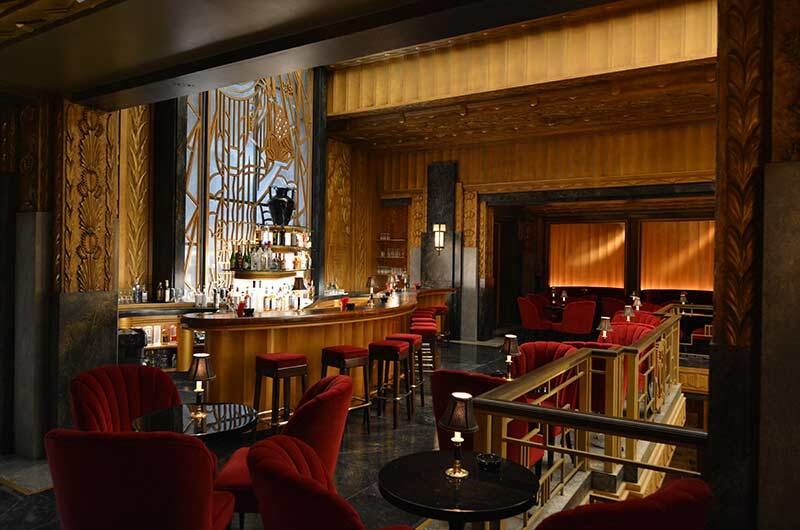 “The bar stools were stained dark and reupholstered thanks to Omega Cinema Props,” says Brill. Note the carving and grillwork, plus the color palette—all nods to the Spanish world of Cortez. Brill has incorporated custom neons and Arik Levy artwork. Custom 8ft bed lacquered with numerous coats of automobile paint! 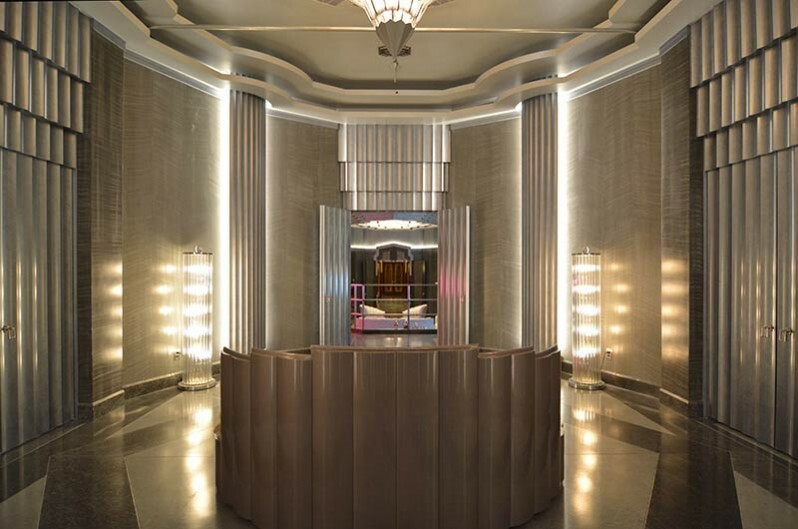 Brill tells of a convenient happenstance, “The seating here is from Omega and it is the same Art Deco designer that I found on eBay for The Countess’s, which I had upholstered and rebuilt due to the condition it was in. This room is appropriately dark, even with light filtering in…. Photo ©2015 FX Networks. All rights reserved. Liz [Denis O’Hare] prepare to take over the hotel! 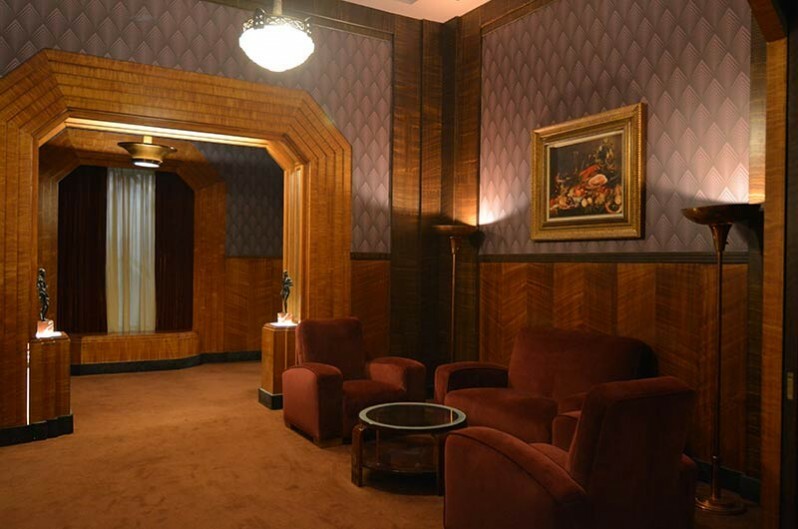 The mysterious Art Deco-styled Hotel Cortez in downtown Los Angeles has become a permanent home for its owners and many of the guests, whether dead or alive. 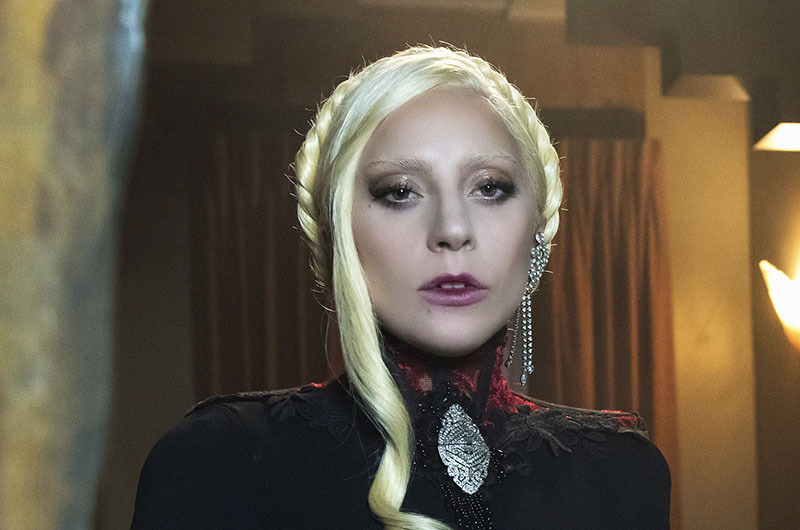 The never-aging, glamorous Elizabeth Johnson, a.k.a The Countess [Lady Gaga], who has owned the hotel since it was built in the 1920s, maintains her beauty through drinking the blood of humans, but her late husband/now grisly ghost James Patrick March [Evan Peters] is the truly evil one, pulling Detective John Lowe [Wes Bentley] into his vast web of serial killers. At least The Countess tries to protect her children…between murders and lovers! 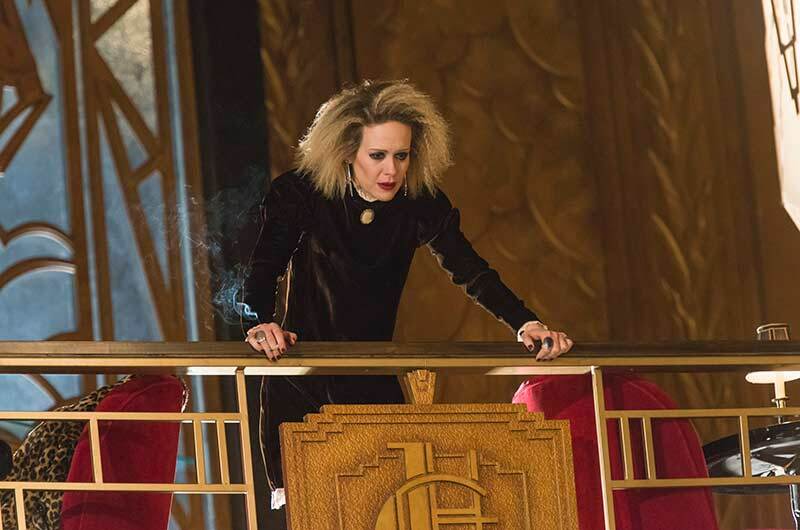 There are the strange mix of peculiar characters we’ve come to expect of AHS, this time including ghouls, demons, vampires and numerous dismembered or mutilated corpses. 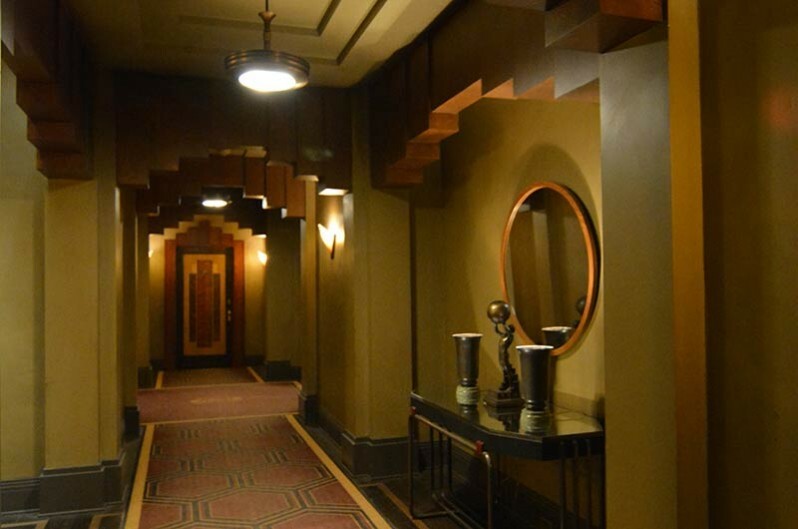 All seem to reside somehow, somewhere in the always distinctive, stylized sets of AHS, this season translated in the odd faded elegance, hidden passages, labyrinthine corridors and secret rooms of the Hotel Cortez. 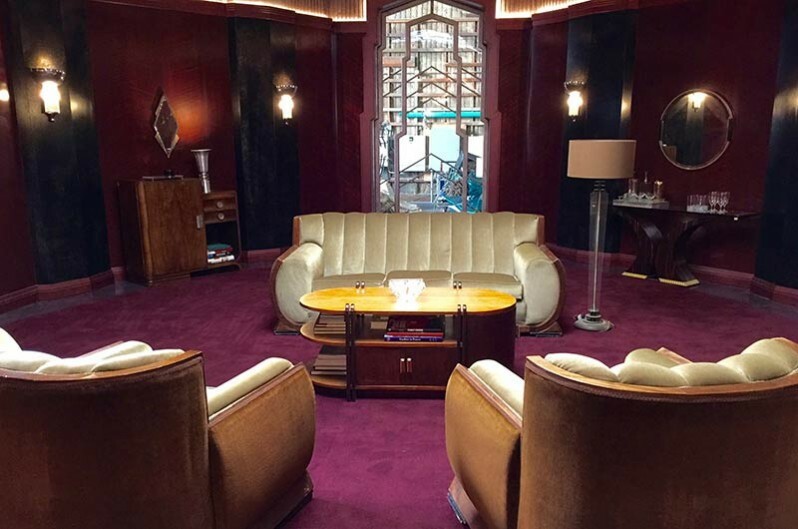 Set Decorator Ellen Brill SDSA: My first decorating job working with Ryan Murphy started when I was hired to decorate his television series NIP/TUCK. It was by far the most interesting, “pushing boundaries” type of television show I’d been exposed to at the time. Ryan’s sensibility about décor and style informed the show and I learned so much from that experience. 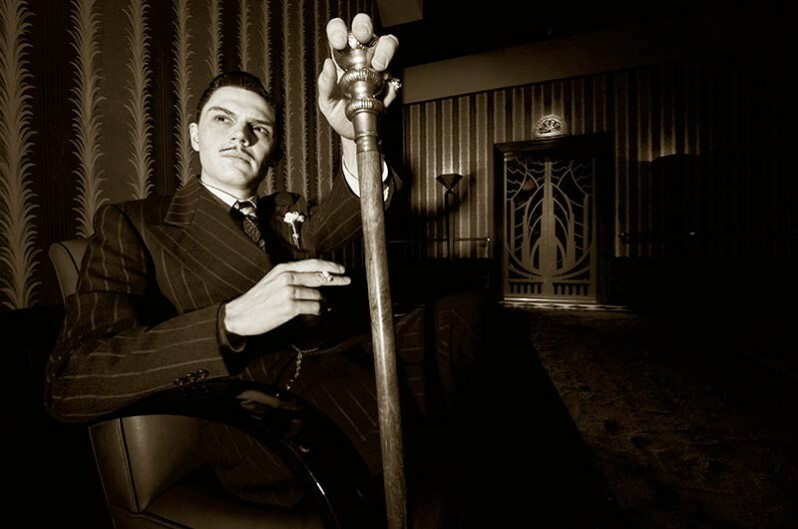 I had the opportunity to do the pilot of AHS with Beth Rubino as the production designer, and when the series was ordered Mark Worthington was hired to production design. Since I was familiar with Ryan Murphy’s world, I boldly told Mark he’d be foolish not to hire me! Since then, we’ve had a wonderful collaborative relationship. Mark has many skills in his toolbox and he does the most brilliant illustrations, which give so much information about the tone of the story and space we are working within. We discuss the feeling of what he’s designed and I start my process of fleshing out the elements to decorate the space with color and materials, furniture and lighting elements, and all of the details that create that particular environment. We do work very closely—I like to show my ideas during the process so there are no misunderstandings with the finished product, and the process has worked well for us. Please tell us about actually incorporating Cortez into the design! 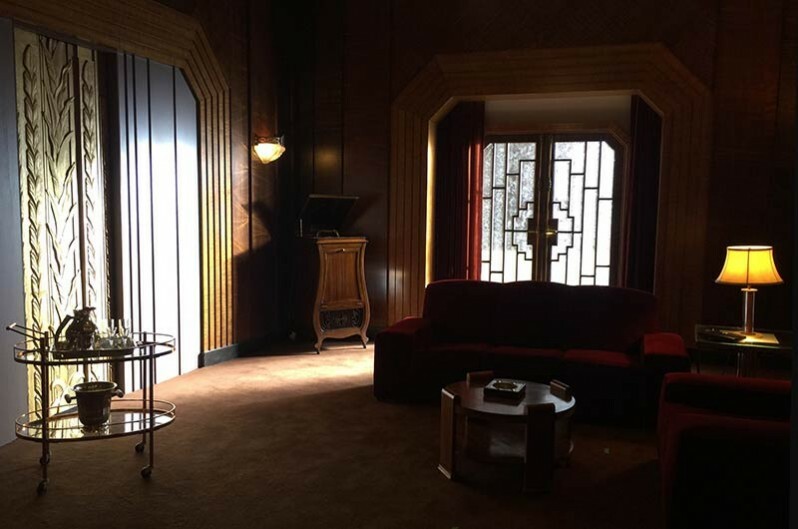 Brill: When Mark heard that Season 5 was centered on a hotel, he suggested Art Deco rather than a California-inspired Spanish architecture, and Ryan liked the idea. 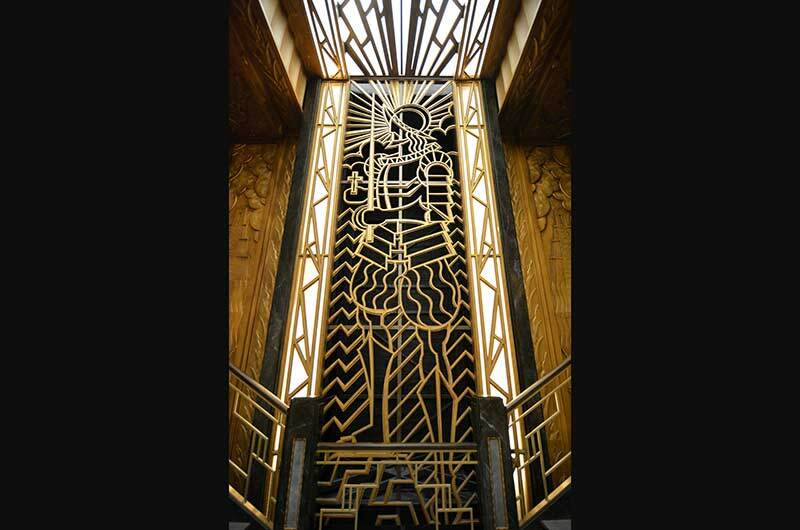 The skylight element incorporates an image of Cortez in the grillwork that begins above the elevator in the lobby. There are other subtle nods to the influence of Spain, including the detailed carvings in the walls. 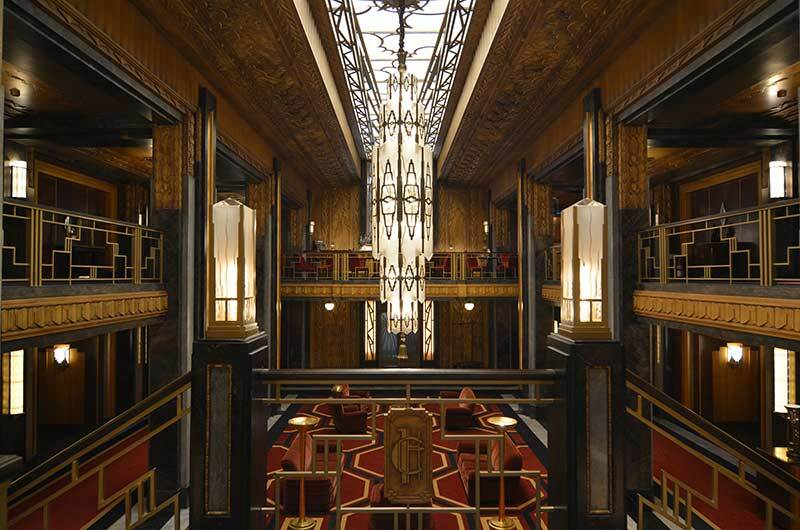 As far as choosing the palette for the hotel, we knew we wanted it to have an aging gilded vibe, so the gold and brass were obvious. Ryan had said he wanted jewel tones and so I pulled all of the many tones of mohair in deep blood reds, maroons, burgundies, rusts and greens that I could find. We had the rugs/carpets in the lobby and hallways custom-made, as well as drapery in the rooms, staying within our deep color palette. 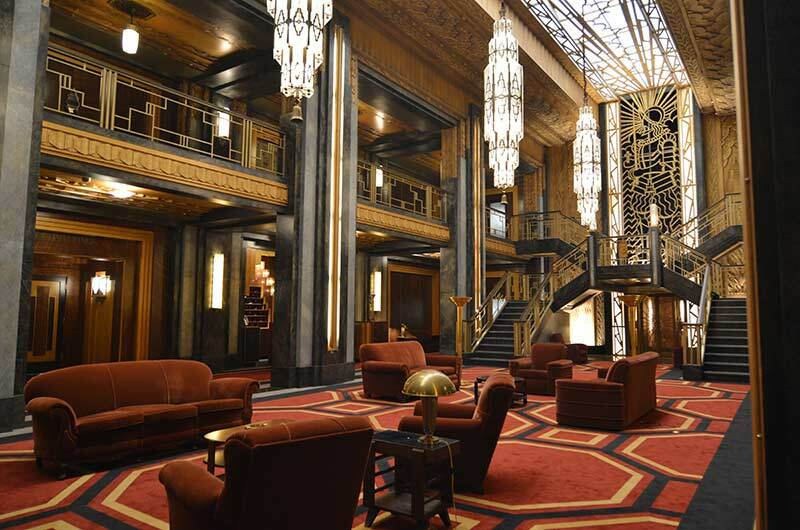 When we started looking for 3 matching chandeliers for the lobby, I couldn’t find any that we could afford. I did find a few singles in the right scale but they were $25,000-$45,000 each, which was simply not doable. So, after weeks of searching, we decided to manufacture them. Mark and I looked over the research and determined the design and details for the set designer to then draw up the plans. 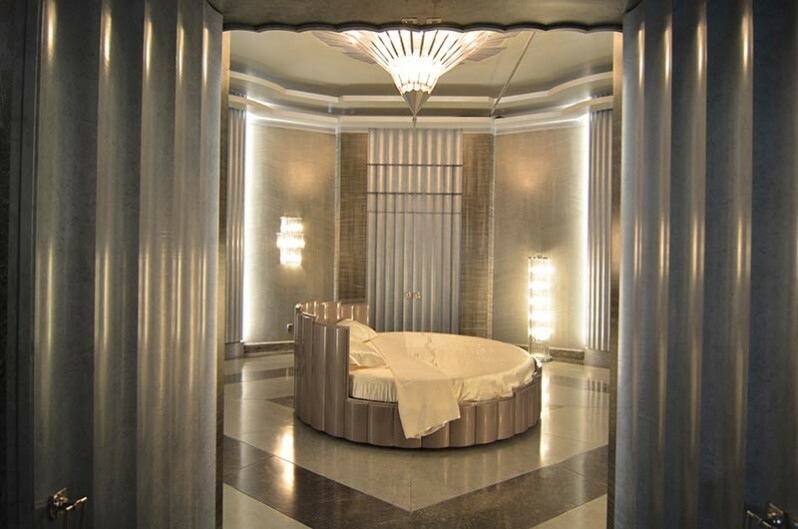 Warner Bros. design shop fabricated the chandeliers and did an amazing job in a very short amount of time. They are 9’ tall! 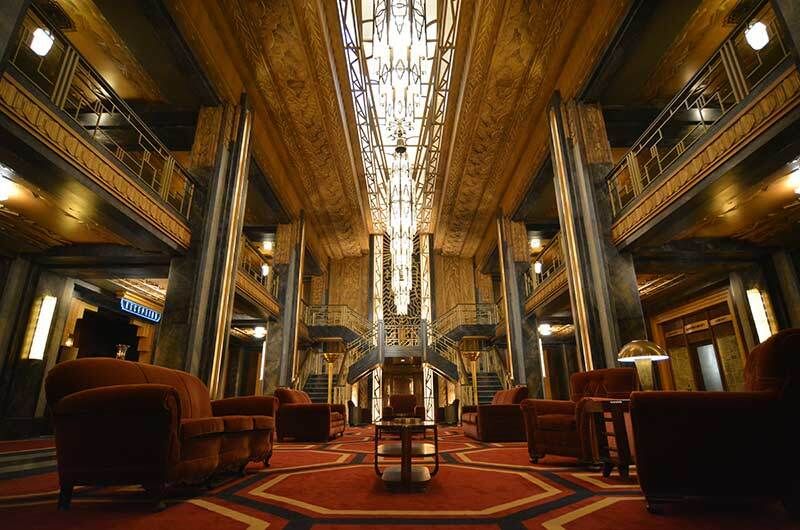 The best part is that Cicada restaurant in the Oviatt Bldg, which was used as the exterior entrance for our set, purchased the chandeliers for the restaurant, so they are still in existence. I hated the idea of seeing them go into a dumpster. 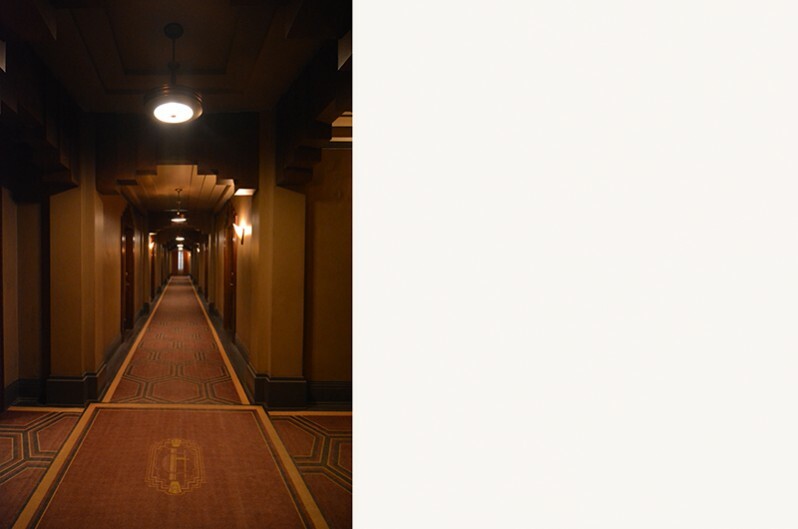 SET DECOR: The hotel’s history: Owner James March built it with hidden corridors and chutes to covertly dispose of his victims’ bodies. Brill: Mark designed and we created a 2-story set, complete with a working elevator, to represent the 6-story hotel. Since the hallways and lobby took up so much stage floor, we redesigned certain rooms and corridors to change over into some of those scary rooms. They also were built onto some of the existing rooms where there was space. The magic of movie making! 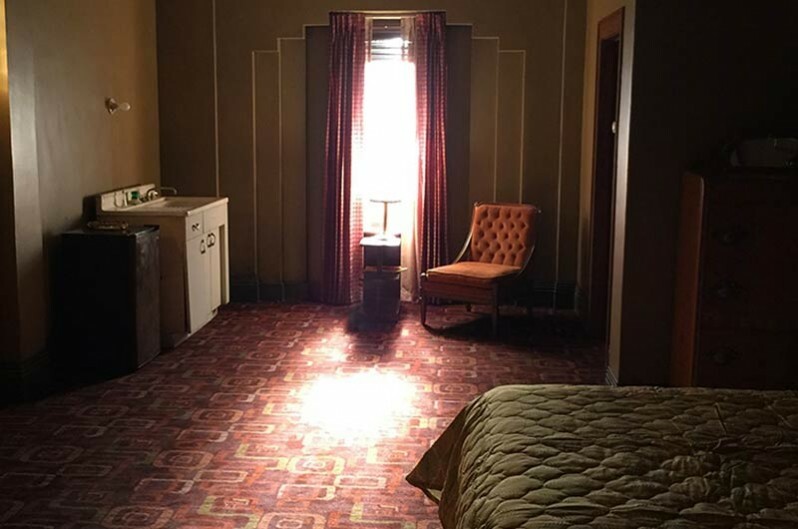 SET DECOR: Is it true that inspiration came from old hotel horror films and actual hotels situated in downtown Los Angeles with a reputation for sinister events, including The Cecil? 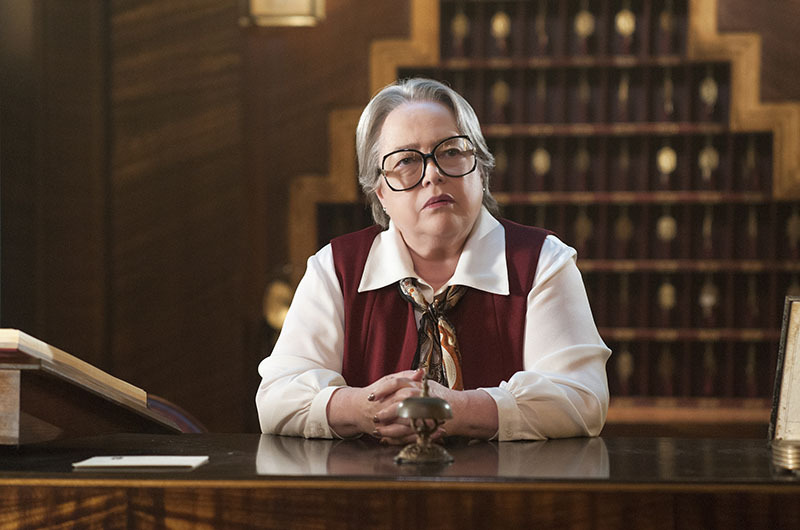 Brill: I do think the hotel horror stories were inspiration for the writers, and the recent finding of the girl’s body in the water tank gave the writing room ideas. 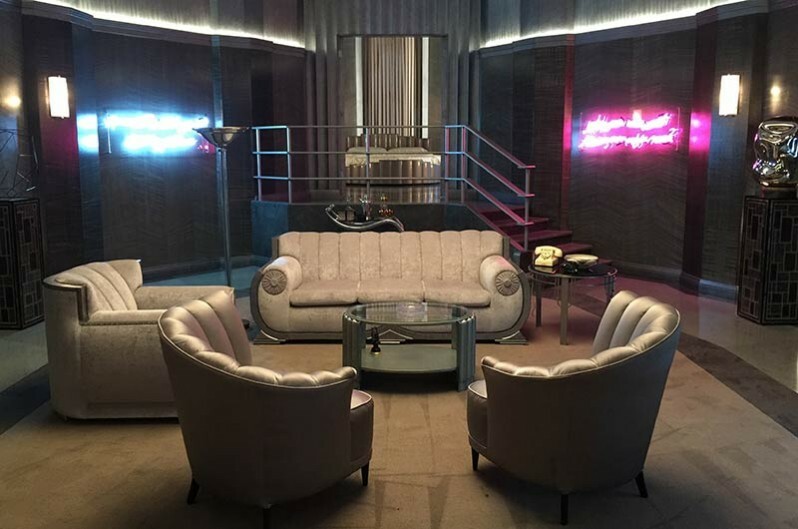 SET DECOR: The Countess and the penthouse – we’re fascinated by the décor! 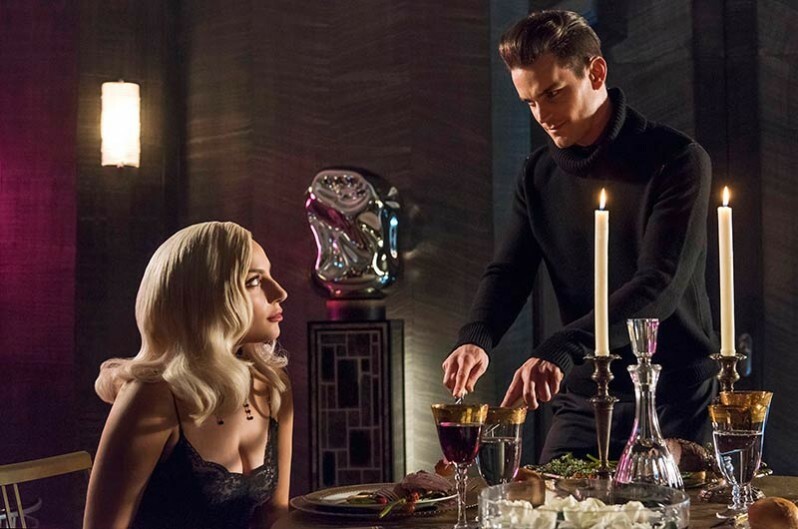 Brill: Once we knew that Lady Gaga was going to be The Countess, I immediately thought of the old glamorous movie stars, the platinum blondes, in a silvery white space. 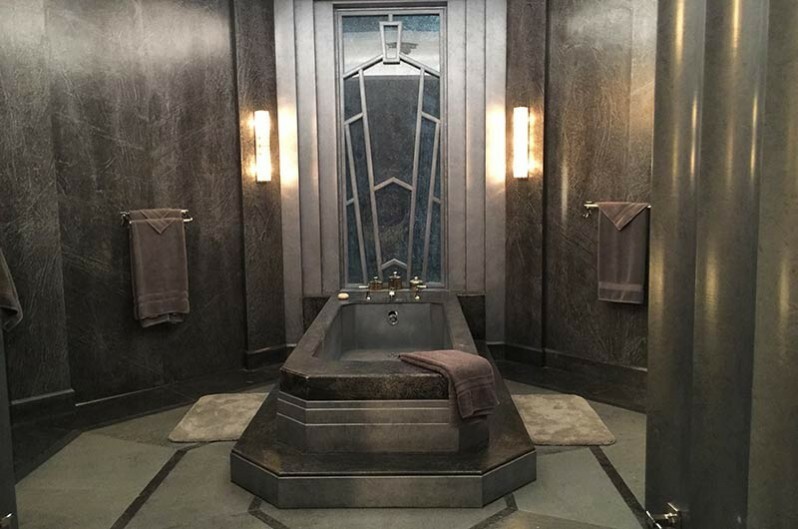 So that was our jumping-off place for her interior. We used platinum, silver and creamy white velvets and satins for her upholstery and furniture. Also, what better color for blood to show up on than cream satin sheets! The 8’ round bed was custom-made and lacquered with numerous coats of automotive paint. 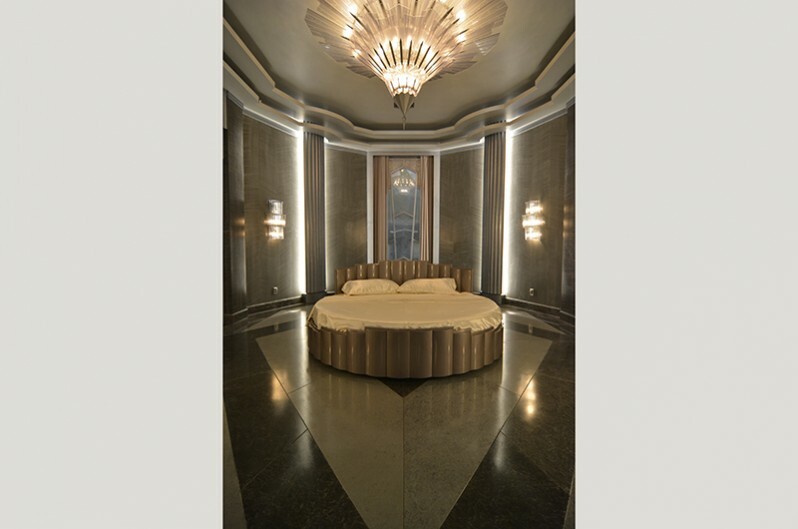 The bedroom’s chandelier, echoing the lines and glamour essence of the bed, was also custom-made. 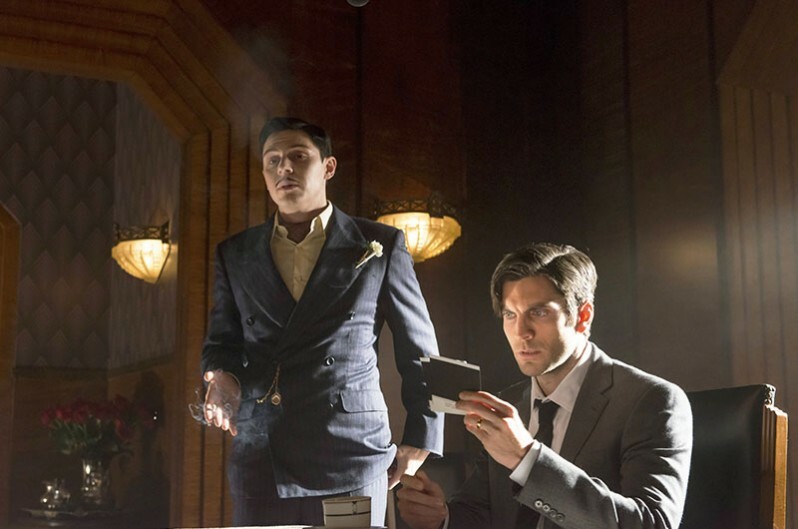 Brill: One of the main mysteries in AHS: Hotel is what happens in Room 64. So, when we were conceptualizing it, we knew it would need to transform to different times. 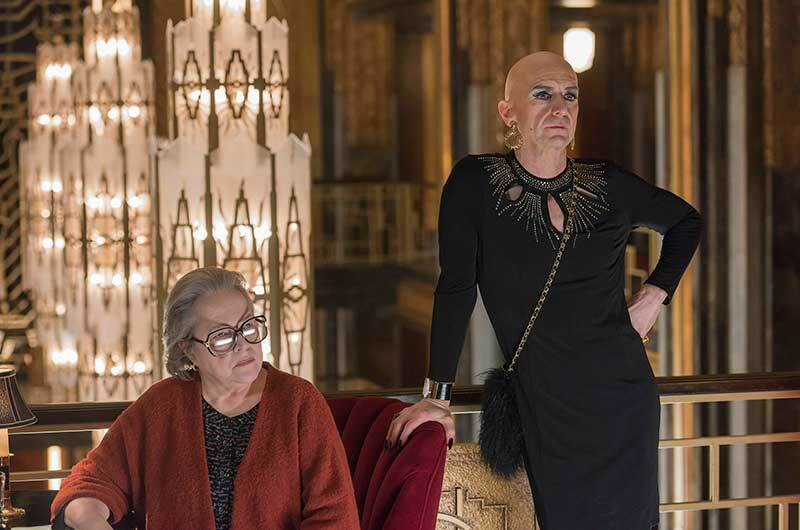 That is one of the most challenging aspects of AHS—whether a room will change over time, or not. And when one first reads the script, one never really knows where it will end up in Episode 12. 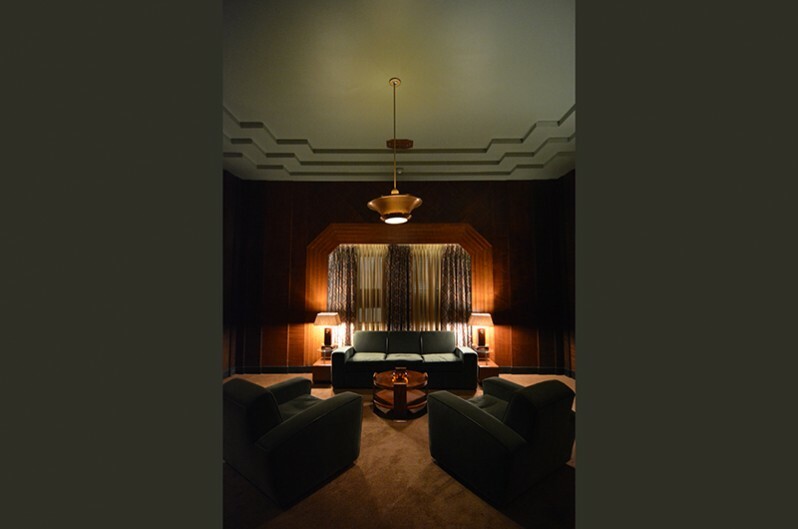 Part of the allure of that room is the depth of color and the heaviness of the furnishings, which are all original deco. I did have the sofa and chairs made since we couldn’t find a perfect set. 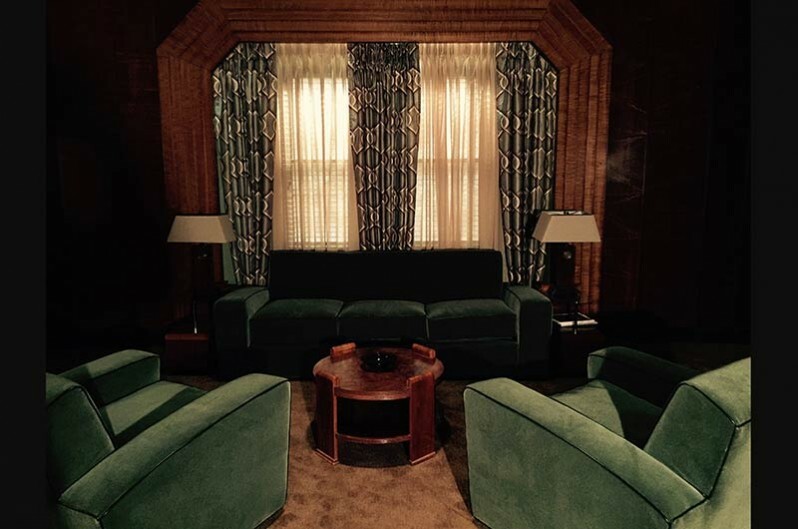 They are in a Paul Frankl design, deep green mohair with forest green leather welting, made by the fabulous Omega Cinema Props upholstery department. 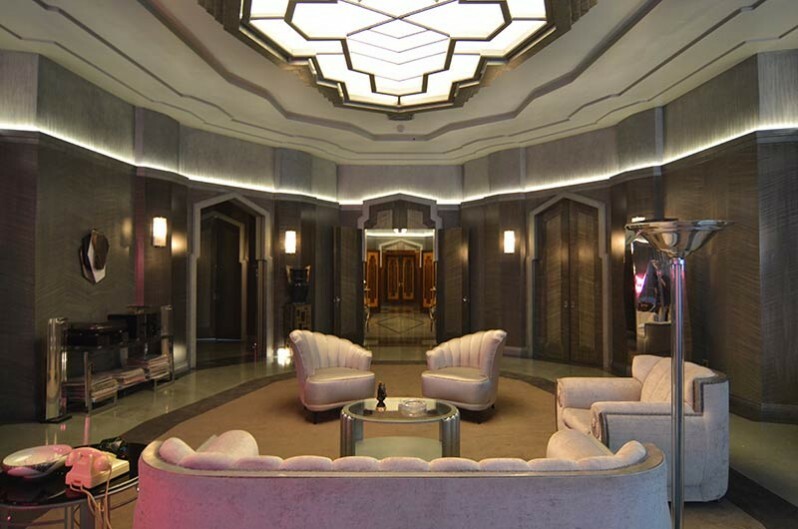 SET DECOR: There were others sets outside of the hotel, but the hotel is so rich and dense that everything pales...though there is the interesting twist of having a motel in the storyline as well. 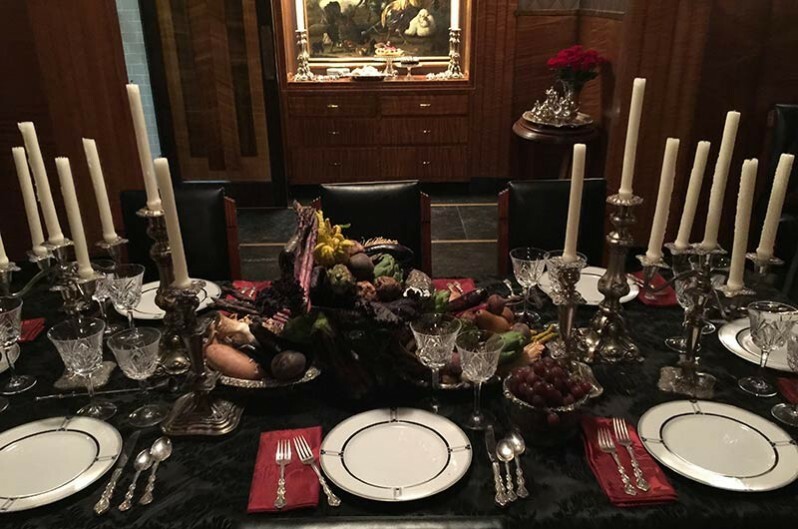 Brill: One of the references for that dinner was having the centerpiece and the artwork reflect the still life paintings that the Dutch artists did, with dead fowl and many different types of fruits, vegetables and weird looking elements. We wanted it to feel “over the top” dark and ominous. 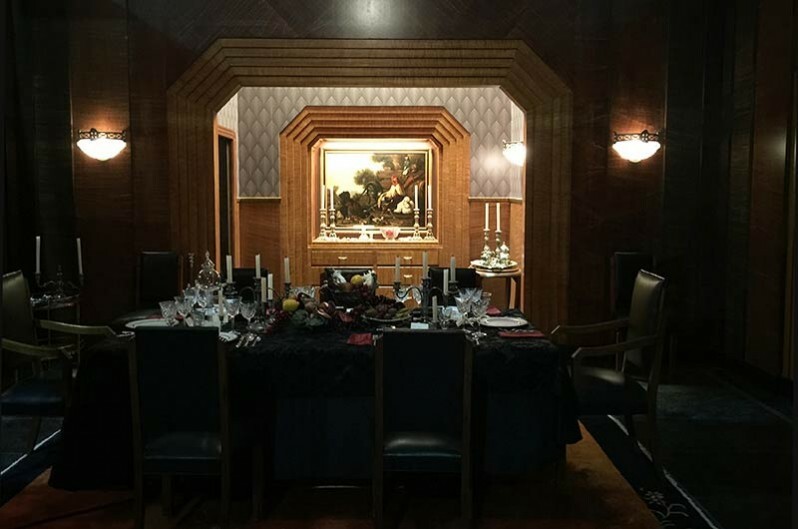 SET DECOR: Speaking of art, the art of AHS could be an entire article in and of itself, particularly the unique minimalism. 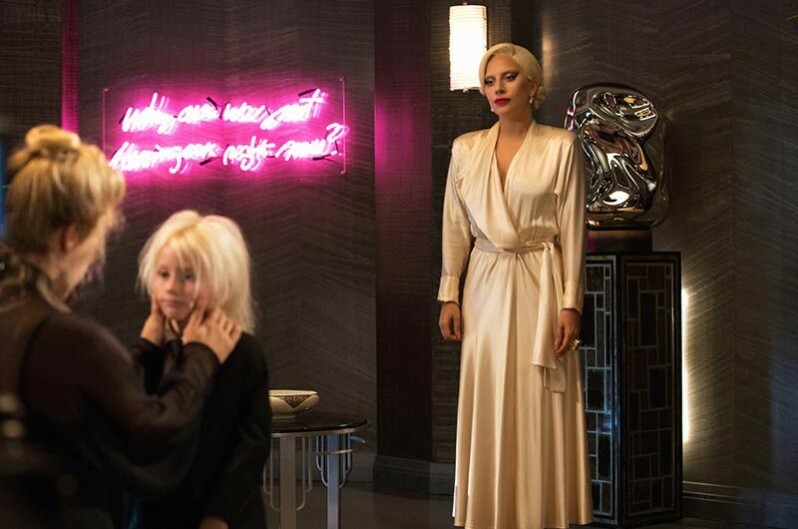 The work of Arik Levy was utilized in this season and actually referenced in the script, the Countess mentions the artist and one of the pieces in “her” collection. Brill: Originally, in the script, there were a few famous artists mentioned which we couldn’t get clearance on. However, one of the producers knew Arik Levy’s work and showed it to Ryan and he loved it, so we approached him and the gallery representing him in LA. We have pieces from several of his series, which are described as “trying to reach the technical limit of the material.” That worked for us! We don’t use very much art in most of AHS, so it is very important when we do. 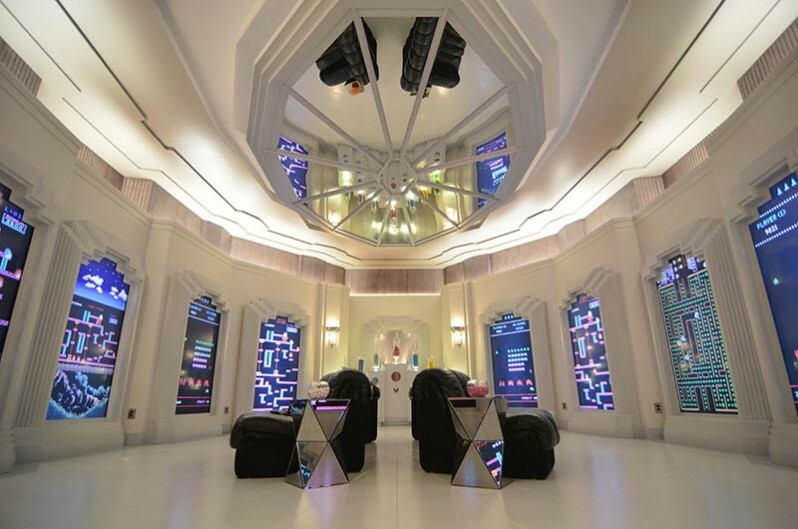 We designed and manufactured the neons in the Countess’s penthouse. One of the ongoing stylistic features of AHS, and NIP/TUCK for that matter, is the feeling of less is more. Rather than have too much information behind and surrounding the actors, which can be distracting, it is a choice to have minimal distractions surrounding the action. Also, sometimes there is too much information transported to the audience. In horror, I feel it can be more shocking if there is a type of void.